TAMPA, Fla. – A great white shark that captured the attention of both marine wildlife experts and Floridians over the last couple of years appears to be making a return. 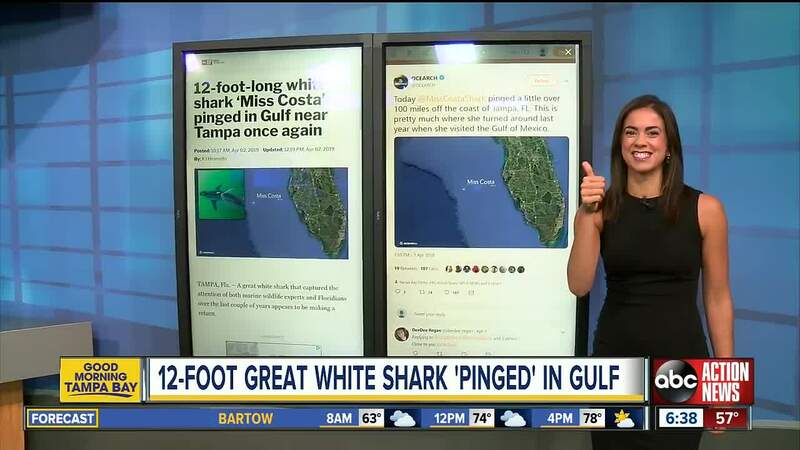 The 12-foot 5-inch 1,668 pound female white shark named “Miss Costa” was pinged a little over 100 miles off the coast of Tampa, according to research organization OCEARCH. Miss Costa was previously tagged in the Gulf of Mexico near Tampa a little over a year ago. Between September 2016 and New Year’s Day 2018, OCEARCH said Miss Costa had traveled over 5,600 miles. During that time period, she had made her way from Massachusetts to as far south as Key West. Fast forward to 2019, OCEARCH tweeted that Miss Costa is now back near the Tampa coast. “This is pretty much where she turned around last year when she visited the Gulf of Mexico,” OCEARCH tweeted. To track Miss Costa’s journey along the Gulf of Mexico, click here for the latest. To learn more about OCEARCH, you can click here to follow their latest work.